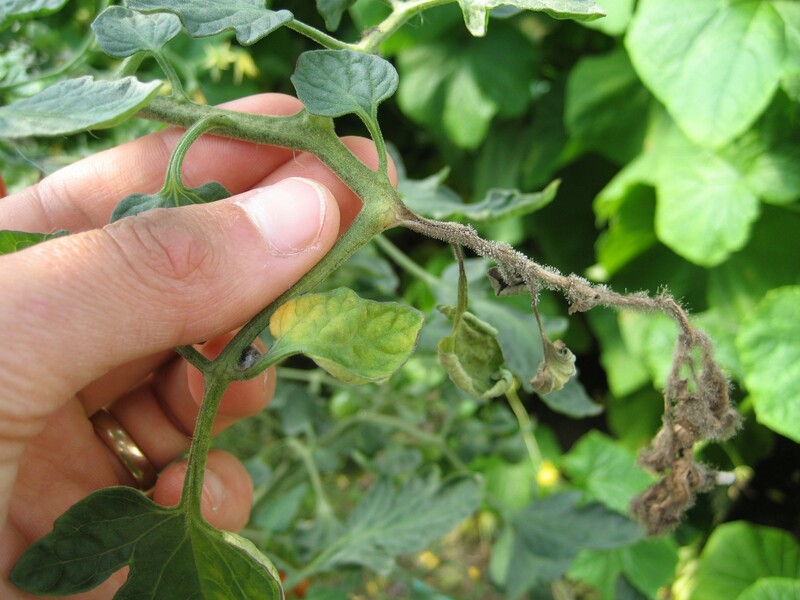 A stem canker on greenhouse grown tomatoes. Photo by Melodie Putnam, 1994. A greenhouse-grown tomato plant with gray mold. Note the fuzzy, gray growth that is the fungus. Cathy Turner (University of Alaska), 2007. Cause Botrytis cinerea, which also causes gray mold in ornamentals. It can appear on any aboveground plant parts. Symptoms Affected tissue in high humidity usually is covered with the fuzzy gray-brown conidiophores and conidia (spores) of the fungus. Infections often begin on flowers and spread to fruit, leaves, and stems. Leaf lesions rapidly cover the entire surface. Infection can go into petioles and stems, which, if severely affected, may be completely girdled, killing tissue above the canker. Stem cankers have a distinctive brown and tan target-spot pattern. Remove all dead and dying plant parts from the greenhouse. Do not leave them in garbage containers in the greenhouse. Keep relative humidity at less than 90%, increase plant spacing, and do not splash water on foliage while watering. Use fans to increase air circulation. A calcium:phosphorus ratio of 2 or higher (measured in the leaf petioles) aids in control. Chemical control Generally not effective unless cultural controls also are implemented. Botran 75 WSB at 1 lb/100 gal water. Do not apply within 10 days of harvest. 12-hr reentry. Cuprofix Ultra 40D at 1.25 to 3 lb/A on 7- to 10-day intervals. 48-hr reentry. Kocide DF at 2 to 4 Tbsp/1000 sq ft. 48-hr reentry. Scala SC at 7 fl oz/A on 7- to 14-day intervals. Use only in a tank-mix with another fungicide effective on this disease. Apply only in well-ventilated plastic tunnel houses or glass houses. Ventilate for at least 2 hours after application. Do not apply within 1 day of harvest. 12-hr reentry. Reference Compendium of Tomato Diseases. 1991. St. Paul, MN: APS Press.